Finding free copyright-free images to use in the classroom isn't always easy. This page shares some ways to find free images to use and some sites that provide free, copyright-free images. Some require attribution. Pics4Learning - Free copyr​ight-friendly images for education. Photos for Class - school-appropriate CC images with automatic citation. Pixabay - Images in the Public Domain. Free to use in any way without attribution. Morgue File - images are free to use for creative purposes with attribution. Permission needs to be sought if using publicly e.g. on a blog post or publicly shared presentation without alteration. Wikimedia Commons - freely usable media files. Some require attribution. Live Binders Creative Commons Collection - a collection of links and information about creative commons. Includes links to sites with free-to-use images. 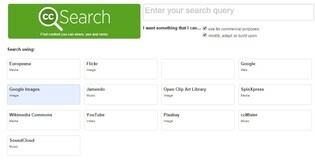 Creative Commons Search - Enables you to choose a library to search eg. Flickr or Google Images by selecting a CC usage licence. Google Search - usage rights. 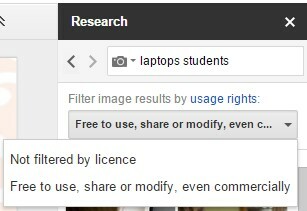 Enter the search term, Click Enter then select images and then select Usage rights.